Upon the long trek from Altaruk to Balic, I traveled an old secret path known only to those within the Order, who sometimes choose to travel this way in order to conserve their mental energies, or new little of the places that they desired to visit. There are several of these pathways scattered across the Tablelands and maybe, according to idle talk, within the mountains which surround them also. This was my first time on the path, and I marveled at the markstones, tall wedges of ancient stone covered with hieroglyphics that detailed the path to come(1). To my delight, they also offered advice for initiates of the Way. They bristled with psychic energy, and I could feel a power of balance emanating from them. One of the mediators had told me that the mark-stone created an aversion field that gave the travelling psionicist protection from the terrors of the desert. I believed her, as no markings of any beast could be seen at the base of the stone, which provided excellent shelter form the burning winds and fiery sun. She also told me that occasionally insights into the Way could be found, although these changed from one markstone to the next, without any discernible pattern. The one thing truly known was that they occurred only once or twice within one’s lifetime, no matter how often the path was walked. The sun was setting, and I could see Ral rising in the east as I came across the fourth markstone. To my surprise, a small campfire was burning near the markstone, and a man could be seen drawing water from a small spring. As I drew near, he placed his hand upon his blade, but made no attempt to pull it from the scabbard, and his eyes met mine as he looked for possible signs of danger. Not knowing how he could be within the markstone’s aversion field without being of the Order, I greeted him as a fellow practitioner. "Well met, traveler, I am Sah’Ree of Nibenay, Master of the Way." "Gentle Winds, traveler, I am Rivvr. The campfire is lit, and the night beckons"(2). The invitation was an ancient one, similar to that used by those who make pacts with the winds. Since I was obviously not dealing with another of the Order, I accepted his invitation carefully. "I have water, and care to seek this shelter." He nodded, and turned back to the drawing the water, although his blade was close to hand. I started to pull some bread from my sack and carefully focusing my will, reached out with tendrils of the Way. Contacting his mind, I could see only swirling winds forming a barrier. I decided not to pursue this further. The winds were carefully constructed, and I did not want to risk angering my host. A piece of meat was cooking on the fire, and in a small bowl near the flames a few roots were peeled. The meat had a delicious aroma and appeared to be coated with kank honey and Gulgan spices. A steaming mug of bitter-smelling Qu’off lay beside the fire(3). 1)The Markstones date from the close of the Green Age, and were created by a powerful Psionicist of that time to enable new practitioners of the Way to reach the secret villages and cities of the tablelands safely. 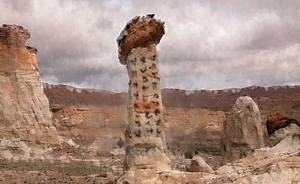 Originally located approximately 12x12 miles apart, many of the lesser markers have been worn away by desert winds so that only the more resilient markstones remain. The markstones are intelligent in some way and can detect the presence of approaching creatures. Should a creature be unintelligent, the stones will allow it to drink from the spring, which is always associated with markstones. The stones then initiate an aversion field that forces the creature away. If the creature is intelligent, however, the markstones instantly create aversion fields, unless that creature is a high level Psionicist (9th level+ and a couple of others). Originally all users of the Way could use the markstones, but members of the Order have been subverting the stones for their own means. Because of this aversion field and the associated springs, the remaining stones, act as safe waystops for travelers. They are located approximately 36 miles apart. However mounts cannot be easily used as the aversion field will affect them. The stones have an additional quality in that they can be "seen" when a Psionicist is using Dimension Walk, who has no chance of being lost whilst on the path. The advice provided can help a Psionicist speed up his knowledge of the way (+5% xp bonus per level if the way is walked at least once per level). Originally they could be used to help train a Psionicist (i.e. a low level Psionicist didn’t need of a higher level Psionicist to train them), but that quality has been lost with the destruction of most of the markstones. reductions in PSP to utilize particular powers. -the ability to permanently use a devotion. They should only occur maybe once in a lifetime, or twice for exceptional individuals. (2)There is a certain code of the desert that travelers use in order to get knowledge about strangers. As a part of this stylistic greeting, mention is made of a place to say, food and water and other facts that a stranger may volunteer. This is important as strangers sometimes find a second watch useful, but on Athas this can also be dangerous. This has been evolving since the Green Age. Rivvr’s greeting is an example of an elemental greeting used by priests and rangers. Examples include Gentle winds, Sweet waters, and Warm campfires. (3)Travelers often coat non-dried meat with Kank honey as it wards off diseases etc, and gives the meat a delicious taste. Other spices are often used also, similar to a marinade. (4)Qu’off is similar to coffee, and like coffee, it helps keep its user awake for longer periods at night, and also help create a light sleep state, which is useful for travelers. Recently discovered by traders dealing with the hinterlands, its use has become highly popular in Raam. However it is also mildly addictive in small doses. It stops Psionicists from focusing their nexus point, creating a 1-point penalty to MTHAC0, and Mac.